A senior Iranian military official has vowed to "set fire" to all U.S. interests in the region and maintained that the Islamic Republic welcomes war with America, according to regional reports demonstrating that Tehran is still committed to fighting the United States in the wake of a recently inked nuclear accord. "In threatening remarks," a top Iranian commander of the Revolutionary Guard Corps (IRGC) stated that Iran is prepared to "annihilate" U.S. and Israeli war forces should they "take the slightest military move against Iran," according to Iran’s state-controlled Fars News Agency. "We monitor their acts day and night and will take every opportunity to set fire to all their economic and political interests if they do a wrong deed," Brigadier General Hossein Salami, the IRGC’s lieutenant commander, was quoted as saying in Tehran on Thursday. In a direct threat to both the United States and Israel, Salami promised to "cut off enemies' hands and fingers will then send its dust to the air," according to the report. These Iranian military officials were responding to multiple claims by U.S. officials that a military option against Tehran still remains on the table, despite the recently inked accord, which aims to constrain the Islamic Republic’s contested nuclear program. In May, Salami said that Iran desires a war with the United States. "We have prepared ourselves for the most dangerous scenarios and this is no big deal and is simple to digest for U.S.; we welcome war with the U.S. as we do believe that it will be the scene for our success to display the real potentials of our power," he said at the time. The comments came on the say day that the Iranian military unveiled a new missile defense system to track enemy threats. "The system can detect and trace targets, take decisions for the operation of the missile systems, decide about the type of weapon systems needed, assess and foresee hostile targets, and field commanders can easily take a final decision with the data provided by the command and control system," according to Fars. Meanwhile, Iranian Supreme Leader Ali Khamenei on Thursday said that Iran is not open to negotiate with the United States on any other issue outside of the nuclear portfolio. Khamenei "reiterated the complete ban on any negotiation between the Iranian officials and the Americans on other issues, and said there won't be any other talks with the White House, except for the nuclear issue," according to Fars. "The U.S. positions are fully against the stances of the Islamic Republic," Khamenei was quoted as saying in a wide-ranging speech. 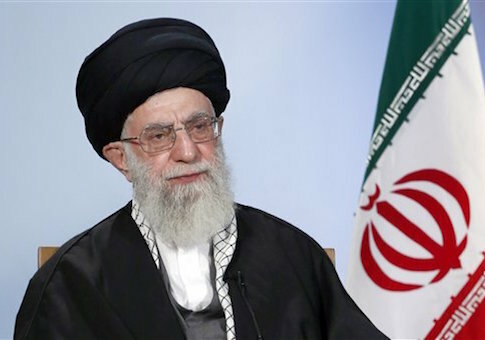 Khamenei also called on the country’s leaders to attack U.S. critics of the deal. "In the nuclear talks with are negotiating with the 5+1, but the U.S. administration is, in fact, the main party; but the U.S. officials speak very badly and a decision needs to be taken about the manner they speak," Khamenei told the country’s powerful Assembly of Experts. "Don’t say that the Americans are uttering these words to convince their internal rivals; of course, I believe that the internal disputes in the U.S. are real and they have differences and the reason for such a difference is clear to us, but what is officially said needs a response and if no response is given to them, the other side's remarks will be entrenched," Khamenei said. This entry was posted in National Security and tagged Ali Khamenei, Hassan Rouhani, Iran, Iran Nuclear Deal. Bookmark the permalink.